Portions of this review also appear in our coverage of the 'Avengers: Age of Ultron' single-disc Blu-ray. The main differences can be found in Vital Disc Stats, Video, and Final Thoughts. "Everyone creates the thing they dread." Marvel's 'Avengers: Age of Ultron' picks up after the events of 'Captain America: Winter Soldier'. SPOILER ALERT in 3, 2, 1... S.H.I.E.L.D. is dead, and the Avengers are operating alone as the world's protectors, but Tony Stark (Iron Man) worries even they won't be enough to save Earth from future celestial invaders. 'Ultron' opens mid-mission, with Tony, Steve Rogers (Captain America), Thor, Bruce Banner (Hulk), Natasha Romanoff (Black Widow), and Clint Barton (Hawkeye) raiding a Hydra lair that's been using Loki's scepter to experiment on humans. Two of these experiments have gained super powers -- Pietro and Wanda Maximoff, aka Quicksilver and the Scarlet Witch. The Avengers escape with the scepter, but Tony has been infected by the Scarlet Witch with a fear of causing the deaths of all his avenging friends. 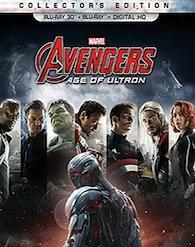 Driven by this nightmare and discovering artificial intelligence within the scepter, Tony secretly initiates his Ultron Global Defense System... which immediately backfires when the robotic Ultron decides the only way to have peace is to tear apart and destroy the Avengers along with a significant portion of the Earth's inhabitants. The Avengers, each facing their own Scarlet Witch induced nightmare, must find a way to stay together while racing across the globe, hunting the world's most powerful super computer before Ultron makes himself invincible and kills a few billion people. The original 'Avengers' marked the climax of the Marvel Cinematic Universe Phase One. It drew together a growing collection of superheroes to save the world from an alien invasion. Even the villain was culled from a prior Marvel production, making the whole thing feel like the season finale of an incredibly expensive television series. That film made over $1.5 billion dollars and cemented Marvel's status as a brand with a singular vision, ushering in a new era of Studios With Their Own Cinematic Universes. But things have changed in the last three years. While 'Avengers: Age of Ultron' offers another superhero world-saving team up, it feels less like a climax than the previous entry. In truth, I'm not certain if this is a story or business decision (spread out certain actors and their characters with limited contracts) or a bit of both. I would argue, regardless of the reasoning behind these choices, Captain America's storyline has become the universe's premium title,and the Cinematic Universe Phase Two is, in classic arc terms, the second act, where they spend the whole time tearing things down so Phase Three can rebuild towards the two-part Infinity War. Either way, fans of the series will likely enjoy 'Ultron' a little more than I do. Oddly, I think it's a movie whose perceived strengths may grow over time because there are a lot of smart choices in the storytelling. The villain is self-made and contained, rather than another nod to a Mysterious Baddie they're saving for a future movie. The theme of meeting one's destiny on the road to avoid it is engaging and timeless. The characters struggle with some real pathos. And most of the action sequences are spectacular. There was a bit of controversy surrounding this film's production, with writer-director Joss Whedon describing the process as rough and rushed. I can't say what 'Ultron' would be like if that process had be a little easier or cohesive, but despite all those positives above, there are times where pacing drags slightly and where the whole experience feels bloated like many other modern-era CGI fests -- how many times do we have to fight an army of metal robots? Lastly, while the film is still supposed to be the climax to Phase Two, it feels much more like a middle-entry where it doesn't quite top the jeopardy and excitement of 'Winter Solider'. It's more like 'Iron Man 3' where there's simply a sense that things are treading a bit of water as they're breaking down and changing. I think as time passes, as Marvel's Cinematic Universe grows and seen is more akin to a novel or a TV series -- a bigger cohesive thing -- we'll look back at 'Ultron' as a fun, but mid-tier entry that ushers the characters one step closer to 'Civil War' and 'Infinity War'. Not bad, but not quite great either. 'Avengers: Age of Ultron - 3D' arrives on Blu-ray courtesy of Buena Vista Home Entertainment as part of a two-disc Blu-ray 3D + Blu-ray + Digital HD Collector's Edition in an special red case. The Blu-ray 3D houses the feature film only; a 3D Main Menu pops up after the Marvel Studios logo. The Blu-ray contains the feature film as well as all bonus materials. Skippable Trailers on the 2D Blu-ray include ''Ant-Man', 'Agents of S.H.E.I.L.D. ', and 'Agent Carter'. The Digital HD code is part of Disney Movies Anywhere (DMA), Disney's cloud-based movie service, which can now be linked to Roku, Android TV, iTunes, Google Play, VUDU, Amazon Video or Microsoft Movies & TV accounts. I was unable to test it out for this film because we are pre-release, but recently connected my DMA (I had Disney Rewards account) to iTunes and earned a free copy of 'Monsters, Inc.' that was instantly playable on my Apple TV or via iTunes on my computers and iOS devices. It's really simple. Marvel's earlier 3D titles might have been slightly underwhelming, but wow things have changed. Encoded in MVC MPEG-4 and framed in the film's original 2.40:1 aspect ratio, 3D is the best way to experience 'Ultron' in HD. Right from the film's Main Menu, 'Ultron' offers fantastic 3D with a remarkable sense of pop-out and window-into-another-world effects. Depth and detail stun viewers with no loss in overall light levels or fidelity compared to the 2D version. In 3D, almost every shot benefits from stereo -- the action scenes feel more grand, while in more intimate moments, the extra z-axis space frames character interactions and separations. If you're a fan of 3D, you're really going to enjoy this Blu-ray. Marvel's 'Avengers: Age of Ultron' storms onto Blu-ray with a resplendent HD video presentation -- framed in the film's original 2.40:1 aspect ratio and encoded in AVC MPEG-4 -- that's just shy of perfection. Modern blockbusters make for excellent HD demo material and 'Ultron' is no exception. It features a muted color palette that expands with sparking CGI laser blasts and Stark computer displays, even skin tones, and consistently dark black levels with excellent shadow detail. There is also no sense of compression artifacts, banding, or other digital flaws. My one complaint is that this 2D edition is less dynamic than the 3D presentation. It's (obviously) flatter, which reduces some sense of compositional scope -- the world, while still epic, is the slightest bit less grand. It's not worth knocking off a full half star, so we'll call this a 4.8 or 4.9 star rating. UPDATED: Presented in 7.1 DTS-HD MA, the 'Avengers: Age of Ultron' mix is quite involving, offering a 35db-wide dynamic range between its softest and loudest sound effects. Surround panning evokes a strong sense of immersion. Dialog is always clear. And, on my current Klipsch loaner system, rocking two front RP-280FAs floorstanders and dual 15" R-115SW subs, LFE effects like explosions and Hulk-roars have demonstrable presence and punch. The mix, standing alone, is quite pleasing, though not as spectacular as 'Fury Road' (which also benefits from Dolby Atmos). When controversy reared up online -- complaints about overall volume and lack of LFE -- I reexamined a few key sequences. Testing revealed, as others have reported, that 'Ultron' plays at 5-10db lower than, say, the trailers featured on its own 2D Blu-ray. This, in and of itself, isn't terribly distressing since we all have volume knobs. The other complaint being presented is LFE flatness. Again, on my system, it sounds quite good, but does "quite good" warrant 5-stars? To judge, I did back-to-back comparisons between 'Ultron' and my favorite 7.1 DTS-HD MA sound mix, 'Pacific Rim', which boasts a maelstrom of surround activity and house-shaking LFE. Even when adjusting the volume, 'Ultron' doesn't compare to similar titles with similar scope and similar channel mixes (wouldn't be fair to compare this to an Atmos mix, for example). In summary, 'Avengers: Age of Ultron' is a tale of two mixes. On one hand, it offers immersion, nuance (particularly the farm scenes), and a very wide dynamic range. On the other, when comparing this title to your favorite Blu-rays, some may be distressed by the lower-than-average base-volume levels, while action movie aficionados will certainly wish for more bombast. As for a numerical rating, I'm going to check off the 4.5 box, rounding up from 4.25 stars, a rating I would give if our system allowed. 'Age of Ultron' descends on the world with a fairly light special feature package -- perhaps the true goodies are waiting in the with for the Marvel Phase Two collector's edition? -- and what's here all appears to be exclusive to the Blu-ray. So skip on down to the next section. Marvel's 'Avengers: Age of Ultron' is a bombastic, globe trotting action movie stuffed with some big ideas about global security, friendship, and fears. It's ultimately a fun character piece, even though it doesn't quite match some of the stronger Marvel productions. As a Blu-ray 3D Collector's Edition, it offers excellent 3D & 2D video presentations and a robust 7.1 surround mix, but is a little light on special features. In addition to the 3D version of the film, this combo pack also includes a Digital HD copy that, when redeemed through Disney Movies anywhere, can be played back via a variety of streaming services. This title is Recommended to Marvel Fans, but those on the fence might want to rent first. If you're an 'Ultron' fan and enjoy 3D and digital copies, definitely pick up this Collector's Edition. If you don't care about 3D or digital, there's also a one-disc Blu-ray edition available too.